WWB will be slowly re-opening some of it's committees. We have decided to do this in an effort to bring back members, share more with our devoted members who have remained with us as well as attempt to bring more activity to the group. We understand that all internet groups are the same. All offer pretty much the same ideas and activities and even though we closed to activity we have had some very loyal members remain with us and keep the friends they have made during that time. Be sure to read our guidelines below, as we open more they too will change somewhat. 1) You just be a women 18 yrs of age or older to join. This is due to the protective child laws on the net. If however you are join and we find out that you are younger than 18 yrs of age, your membership will automatically be revoked. No questions asked. 2) Any member wishing to join will be expected to maintain a positive attitude and outlook about our group and it's members. You will NOT criticize, gossip or be hateful towards any member. If you do, you will be removed from this group. 3) While the members have the freedom to speak about anything in our egroups lists, fighting between each other, bringing hard feelings from another group into ours will not be tolerated. Doing this you do risk the chance of being suspended from posting and possibly loosing your membership. This guideline in simply in place to protect ALL our members. Our goal is to create a group where women can come to be themselves. You will not be judged on your attitude, race or creed. We welcome everyone no matter who you are. All we ask is you follow our guidelines. If the guidelines do not feel threatening to you and you feel you can abide by them then you are welcome to go ahead and click the link below to join our egroup. Please note that this is and can be a high volume emailing list. There are many things shared among our members from tubes & tags to recipes and prayers. Please be sure your email settings are set to what you personally can handle as an egroup chat member. 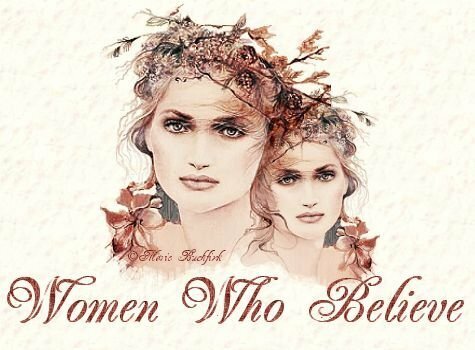 Women Who Believe was founded on Aril 27th 2001 by Paula Hestad. Any questions or comments about this group or it's contents should be directed to her personally using the email address provided.